South America is a vast mysterious continent and 40 percent of it is covered by the amazon rainforest alone. A huge contrast of geography can be found in the andes mountains, where snow and ice have preserved human remains for hundreds of years. Archaeologists are still digging up cities from pre columbian civilizations and there could be so much more here that has yet to found. From golden treasures discovered in Colombia, to fossils of the largest dinosaur ever to walk the earth, here are unbelievable discoveries in south america. After most of the gold was plundered by the Spanish Conquistadors very few original artifacts remain in this region of Columbia. A lot of pieces that were found by farmers were unfortunately melted down and made into bullion. This ceremonial mask is worth over $300,000 USD in gold alone and was used as a funerary mask until the grave was robbed. The lucky farmer who found the mask in 1992 made the right move and told no one about its existence right away, but eventually sold it to be preserved in a museum in Bogota, Columbia. Soon after word got out, the malagana gold rush took place which lead to countless more grave being plundered. Many artifacts will be forever lost in this country and were prized for the material it was made from, not it’s historical value. The city of Chan Chan in the country of peru was founded by the Chimor kingdom in 850 AD and the largest city of the pre-columbian era in south America. The name chan chan translates into Sun Sun for it’s warm sunny climate. It was eventually conquered by the Incas and the city fell into decline during the 15th century AD. Known for it’s great riches, it was looted by the spanish conquistadors and they managed to recover roughly 5 million dollars worth of gold here. In modern times, the city was excavated in the 1960’s and eventually it was designated as a unesco world heritage site. It’s under threat by various environmental factors including heavy rains, flooding and powerful winds. More in depth excavations would also reveal this to be the site of the world largest mass sacrifice with more than 140 human skeletons discovered and hundreds more from llamas in 2019. Does anyone wonder why there’d be a Russian Antonov A2 Plane all the way in the Peruvian Amazon? Antonov An-2’s were used for agricultural purposes and it was mass produced by the Soviets as a crop dusting plane. It was a reliable machine that could be made quickly.. It got quite a few nicknames such as the Annuska or Annie, Type 22 and colt but this one in particular is known as the ghost plane. .Russia at that time was hoping to gain support from Peru with in various trade deals and then hopefully they could set up bases there. This one looks quite remarkably preserved considering the moist climate of the amazon. This one actually wasn’t discovered by humans first but wild amazonian animals who made it their home. There are videos out there that claim this plane is actually haunted at night but who knows! WE imagine it gets pretty dark in the jungle late at night. 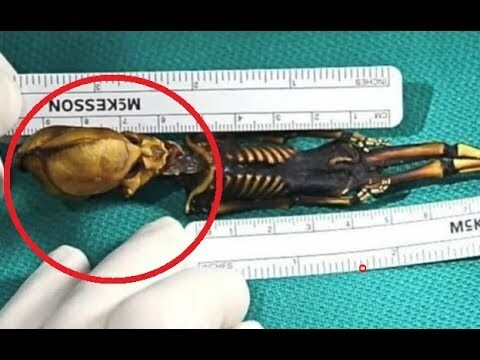 Ata the nickname given for the 6 inch remains of a humanoid- alien like creature found in the desert of Chile. Also known as the driest place in the world, this desert is home to year long droughts, in addition to alien sightings. Seems like many UFO sightings prefer the vast and secluded areas of various deserts. What makes this creature unique from humans is that it has 10 ribs and the skull is extremely strange in shape. It was on display at a museum in Chile but many people began to wonder if it was actually from this world. With too many questions from the public, it was hidden away from the public. Some believe it was a fetus born prematurely with extreme defects like dwarfism but no specific genes for this genetic disorder were uncovered. A vegetarian dinosaur with unusually large canine teeth was found in the country of brazil that existed 260 million years ago. It’s known as the tiarajudens and it’s almost like a turtle with no shell and large teeth. Archeologists originally thought they had uncovered the fossil of a new fierce carnivore but it turned out this dinosaur prefered leaves over meat. Scientists are nicknaming it the sabre-toothed tortoise and was the size of a large dog. The canines were about the size of crayons and it even had teeth on the roof of the mouth These were most likely served for self defense purposes and used for scaring off large predators opposed to ripping apart flesh. All’s Quiet With Julian Assange…UNTIL NOW! Hours Away From the Unthinkable—Arrest or False Alarm?